Before laying the floor it’s necessary to make a penetration of concrete foundation for proper adhesion of adhesives. Within laying of the floor it is needed to take care about humidity concrete floor on which the parquet floor is glued. Humidity of wooden parquets is also important. Moisture level of parquets and flooring must conform to the standard tables. Otherwise it’s probable that the laid parquets start "work” (to create unevenness over the entire floor area). Parquet can be installed in several ways , the most common of them are "tree", regular or irregular brick, while the last of them is becoming more popular these days. If you choose the method of the laying called " irregular brick", the procedure works as follows: on the cleaned concrete surface (preferably with dust removed) will be applied the adhesive with a notched trowel BonaBond . Adhesive is spread and now parquets can be laid with regard to the incidence of light. Parquets will be placed in three rows so that the other rows avoid overlaps. Let the glue dry for about 1 hour . Machine, which is used for parquets renovation is imported from Italy. its high speed motor 1.5 kW give it a very good suction power - to absorb about 98% of all dust - and unlike other models is also characterised by significantly lower noise levels. For actual floor sanding is used sandpaper grit 36-40 grains per cm2. Within grinding it’s processed with regard to uneven floors. Sawdust machine captures in a cloth bag. Direction of grinding varies depending on the type of laying parquet. Grinding floors with an approximate area of 20 m2 takes about 1.5 hours. Design constraints do not allow the machine to grind the floor to bare walls of the room, about 15 cm remaining belt will then grind a little edge sander with dust extraction, where can be short arm replaced as necessary by long one. After sanding the edges with sandpaper floor is stripped of any dirt and wood starts to look more vivid. 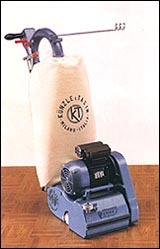 To grinder is fitted with a finer sandpaper grit 60 / cm2 and flooring is diagonally resurfaced. This will achieve the greatest elimination of inequalities. This second grinding takes about 1 hour. For the last, final floor polishing, is used sandpaper with grit from 80 to 100 grains per cm2, which is a very fine paper. Grinding is done with regard to the incidence of light into the room from the entrance to the windows. After about an hour of parquets grinding are grinded also the edges od floor in the same manner and the floor is ready for painting now. 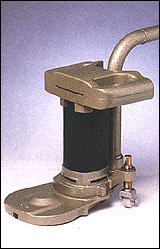 Among the grinding is also an option to use a filler. However, only in the case when the floor does not move and did not creak , otherwise filling in the joints will crumble. When filling mixed with fine sawdust (sucked within the last sanding) and caulking paint so that sawdust is spilled on the polished parquet (the amount estimated by the size of the place) and slowly into piles of sawdust instill sealing lacquer (Fungenkit). Using spatula filler are mixed with sawdust gradually and thus obtain the concentrated mass, which work in all over the room to the joints in the floor. Then floor will be raddled twice and after about 15 minutes, the sealant in the joints fail. The procedure is repeated once again and after drying floor (after 30 minutes) the floor is abraded with the fine paper. Finally edges of the room will be gently grinded with 80-grit paper. Adjusted parquets can be before painting polished with calender, giving a perfect smoothness effect to the floor (there is a smoothing of the pores in the wood). Polishing surface area of about 20 m2 takes about two hours. Result of the floor smoothness is comparable with the smoothness of crockery. Smoothing also contributes to minimal infiltration of paint that remains on the surface and thus contribute to a more pronounced effect. For polishing is used a special grille, which is substrated under the polisher, which automatically draws the grinded fine dust. Thus prepared room before painting has to be stripped around - customer can choose from approximately 30 samples. Placing rails is adjusted by the acrylic sealant. Room has to be vacuumed and then we can begin to paint. For coating are used Swedish environmental, anti-slip coatings Bona with UV-filter, which are certified by the Health Officer and are available in several types. For floors with a normal load use Bona lacquers TechHome, while for floors with high load prefer TechMega Bona lacquers. When coating is used basecoat Bona Quick, which is applied three times in a row in 15-20 minute intervals. After the last deposited layer we should wait about 30 minutes until the paint is dry, and then it can be applied topcoat. When applying, proceed as follows: 1 liter of lacquer spills on the parquet floor and spreads with a roller from the back of the room, across the room and then spread to about 1.5 meter lengths. Coating cross is performed on the ground to avoid omitted points floor. After painting the whole room starts to shine, but after the paint has dried, which takes about 8 hours, the paint darkens and is semigloss. The varnished parquet floor you can enter the first following day without the footwear so as not to scratch the paint. Moving furniture and furnishing appearance of a room can be accessed after 5 days, but it is required to support the legs of furniture, tables and chairs, with some soft material to prevent scratching the paint. Parquet can be washed soon after 1 month, which is the time required for curing paint. Parquet can be washed after 30 days with warm water mixed with detergent (suitable as Pronto or Polish on floor). These preparations dilute with water according to directions 2-3 caps into the bucket. Wipes out the normal way. Within normal floor renovation is needed to vacate the room in order to get the machine to the very edges. Dirty floors have to be cleared of the largest deposits of impurities first, thoroughly sweep and remove the spikes protruding nails or any skirting that is finally replaced.